Agathocles was a Greek tyrant of Syracuse (317–289 BC) and king of Sicily (304–289 BC). The son of a potter, he learned his father's trade, but afterwards entered the army along with his brother Antander. He was twice banished for attempting to overthrow the oligarchical party in Syracuse. In 317 BC he returned with an army of mercenaries under a solemn oath to observe the democratic constitution. Instead he banished or murdered some 10,000 citizens, and made himself master of Syracuse. He created a strong army and fleet and subdued the greater part of Sicily. He warred with Carthago, but was finally defeated in 307 BC and returned to Sicily. 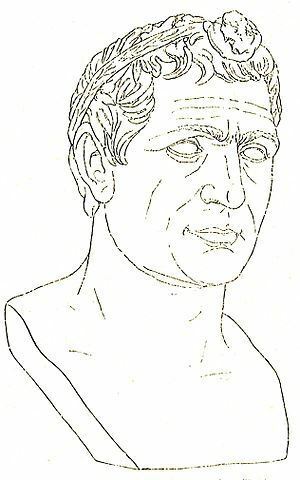 He then conquered Sicily intead, and styled himself King from 304 BC and forward. His last years were plagued by ill-health and the turbulence of his grandson Archagathus, who eventually poisoned him. He restored the Syracusan democracy on his death bed and did not want his sons to succeed him as king.